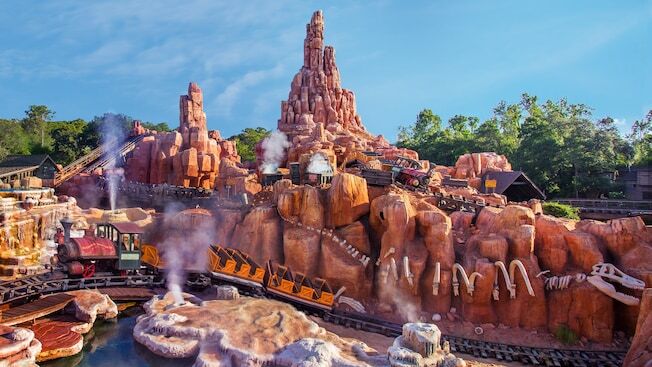 Big Thunder Mountain Railroad is a wild race through a haunted gold-mining town aboard a runaway mine train. Take this fun quiz to test your knowledge of Walt Disney World’s Big Thunder Mountain Railroad. What land is Walt Disney World’s Big Thunder Mountain Railroad located in? What year did the Walt Disney World Big Thunder Mountain Railroad open? How many passenger cars are pulled behind each locomotive on WDW’s Big Thunder Mountain Railroad? How many passengers can ride in each car on WDW’s Big Thunder Mountain Railroad? What is the name of the fictional gold mining town that WDW’s Big Thunder Mountain Railroad is set in? 20+ animatronic animals can be spotted on WDW’s Big Thunder Railroad including all of the following except __________? Reaching top speeds of 30mph, WDW’s Big Thunder Mountain Railroad is the fastest ride in the Magic Kingdom? The queue area of WDW’s Big Thunder Mountain Railroad takes you into the headquarters of ____________? The following are unique train names of WDW’s Big Thunder Mountain Railroad, except for __________? Quiz: How well do you know Disney’s Adventureland at Magic Kingdom? Quiz: Walt Disney / Pixar: How Well Do You Know The Movie Up? Awesome! You got a terrific score!!!!! Good – and hard – quiz! You ALWAYS do a great job!!!!! I counted three cars on the back end of the train in the photo above the quiz! I guess someone Photochopped the pic! Otherwise I would have gotten 90%. I didn’t know it was a 1980 addition! Yeeeeaaaaaa. Im obviously not an expert here! This here is the wildest quiz in the wilderness.